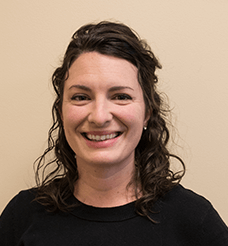 Amy Winkel received her Physical Therapist Assistant degree from Baker College of Muskegon and has over six years of experience as a licensed PTA. She specializes in McKenzie Method of Mechanical Diagnosis and Therapy: The Lumbar Spine and the Cervical and Thoracic Spine. Amy has also completed Select Functional Movement Assessment Level 1. Outside of work she enjoys traveling, hiking/running/biking, and reading.